What does it take for a public figure to go PUBLIC? In the April 6, 2011 | Issue 67 of American Institute for Cancer Research (AICR), the article below takes centre stage. I would urge our readers to subscribe to this newsletter. I am not advertising it for any other reason except that I have once attended their conference, which is held every November in Washington DC at the Capitol Hilton Hotel; secondly, I receive this newsletter for free about ongoing research and latest findings on cancer. Dr. Steck’s message is fairly informative and leads me to my main editorial for this issue, issue 43 of AJFAND. I have a hero in Hon Prof. Peter Anyang’ Nyong’o, Kenya’s Minister for Medical Services and wish to highlight his story here. If you are a lover of Kenya and find yourself regularly looking up news about the country, then you would not have missed this story. I was first touched when the Minister on two occasions devoted his regular weekly column to his own experience with prostate cancer. This was brave and completely unheard of, that a high profile public figure would do this. Other revelations followed including a TV documentary in a three part series, accentuated by his arrival in Kenya on March 6, 2011 after three long treatment months away in the USA. What impressed me most was the fact that our Minister, who is a world renown political scientist came out to not only disclose this very private matter to the public in Kenya and beyond, but also did it in such clear terms that anyone could have mistaken him for a Medical doctor, or something close. Something else is that in Kenya, the lives of public figures are normally left to speculation and innuendos and untruths, especially so because they themselves rarely come out to tell fact and truth. The Minister chose to tell his own story. Further, men rarely come out to admit illness. They in fact suffer quietly from prostate issues, a condition that has apparently become fairly common in men over 40, even in Kenya. Like most cancers in Kenya, this one is reaching epidemic levels. The story below is lifted straight from our leading daily newspapers in Kenya and I thought I should just reproduce as was reported. I could not have done a better job. 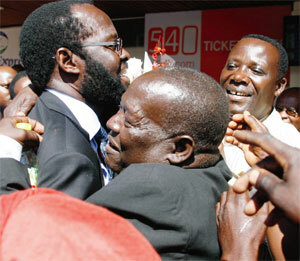 The picture above of a jovial Minister appeared in Kenya’s Daily Nation of March 7, 2011 as shown above. The Minister, quite a prolific writer has promised to write something for AJFAND on the nutrition advisory he received for his condition. “Struck by prostate cancer, treated abroad with the latest technology, and now on chemotherapy, Medical Services Minister Prof Peter Anyang Nyong'o has a new mission in life”. “Sitting at the apex of Kenya’s health services, and having come face to face with the cruelty of cancer, he is worried about the chances of survival for those not as privileged as himself, who could afford long treatment abroad”. “Why? Because, although he thanks God for his recovery - evidenced by his springy walk, upright gait and charming smile when he arrived home from treatment yesterday - he says Kenya is using technology discarded 20 years ago to fight cancer”. “His focus will also be on the quality of healthcare programmes in the country, its affordability to the greatest number of Kenyans, and formulation of an insurance cover for the poor to access medical services”. "My experience is a wake-up call for us in Kenya to build comprehensive cancer care centers for our own people, and for the eastern Africa region. 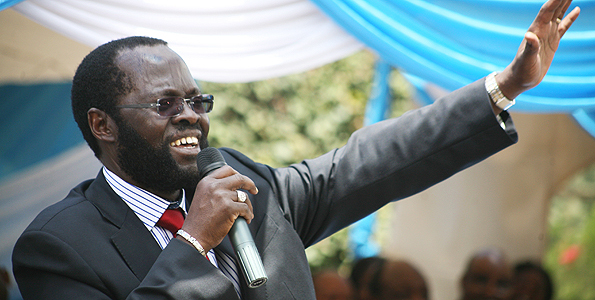 I know we can do it if we begin by walking the talk,” said Nyong’o. “The Minister, who left the country last December, said his predicament as a cancer patient served to highlight some deficiencies in the provision of medical services in Kenya, and their disparities”. “With his wife Dorothy literally at his right hand, Nyong’o took his seat, reflected on his close shave and thanked God for it, then prepared to tell the country the story of his battle with prostate cancer. He had just landed at Jomo Kenyatta International Airport from the US, and into the waiting arms of friends and relatives”. “He looked cheerful, albeit reflective, probably because of the traumatic experience his medical condition put him through. He, however, declared he would not shy to share with Kenyans his progress. He also reminded journalists present of the fact that, unlike many public figures that wade through various ailments in secrecy, he chose to go public as a way of demystifying his condition, and to encourage Kenyans to undergo frequent medical check-ups”. “It was in one of his check-ups that he came to know he was suffering from prostate cancer, which he says is a leading killer of men, if not detected and treated early”. ”Currently prostate cancer is one of the leading killers in our country, but we are not ready to talk about it. This is sad because when prostate cancer is detected in its early stage, it can be treated through radiation or surgery by modern science and technology. I hope by talking openly about it, I would start a conversation around it,’’ he told The Standard correspondent in the US last week. “Yesterday, he kept to this script, while appreciating that Kenya’s cancer treatment is backward and outdated, as he spoke to the media and members of the public at JKIA. He also declared he was now well and ready to resume his duties”. His speech shifted attention to the hapless Kenyans struck by cancer, but who have to queue for months for their turn in the old-fashioned, and often non-functioning radiology machines, at great cost, and often with the fear the expensive procedure won’t stop death lurking in the shadows”. “The minister revealed he would dedicate most of his energies to helping Kenyans suffering from prostate cancer and other diseases. He also promised he would push for a national social health insurance scheme for all Kenyans, irrespective of their social status, so that all can access treatment”. "I decided to go public on my condition because I feel prostate cancer is a social thing and not a personal one. I was also fortunate because I have a health insurance. What we need is proper planning, social investment and technology, for us to realise our dream,” said Nyong’o. “He said as Kenyans become more affluent, their health status would inevitably change. Health policy for Kenya will change from infectious diseases associated with poor economic status to ‘lifestyle’ diseases for the affluent, such as cancer, diabetes and stroke, he explained”. "As of today it is regrettable that despite an already heavy cancer burden in the country, there is no existing Cancer Control Policy. Although we had some of the brightest minds around in terms of medical science, we had not availed them opportunities for continuous medical education: hence quite often they performed well below their potential,” said the Minister with regret. “While at the University of California in San Francisco’s Mount Zion Medical Centre in the US, where he underwent Intensive Modulated Radiation (IMRT" he said “For most Kenyans, prostate cancer is a very expensive affair, currently only possible in private hospitals. Anyone would be surprised to know that very little focus is placed on geriatric services in Kenya, leave alone cancer,’’ said the Political Science Professor. I wish to credit the online version of the Standard Newspaper in Kenya, website www.eastandard.net for most of the story here, and the Daily Nation www.nationmedia.comand their reporters and photographers. I receive regular updates from the American Institute for Cancer Research www.aicr.org and the latest but one reporting is on the role of diet in improving quality of life, longevity and keeping cancer at bay. For more information I advise that readers visit the AICR website. You can even join to receive useful updates on a regular basis, as stated earlier. Even as we all become so busy that increasingly we rely on others to prepare our meals either in restaurants or in our homes, we could do better by taking greater interest in what we eat. There is increasing research evidence that what we eat is closely associated with our health status and that many forms of cancer could in fact be prevented or delayed by better eating habits. Please send in comments about this subject that can be shared for the purpose of keeping our readers better informed.